Note: Vision therapy is not a cure for disability. 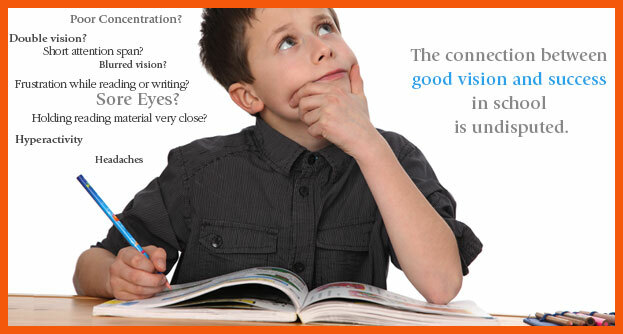 The aim behind vision therapy is solely to resolve visual problems. The issue at hand is not as much a physical deficiency, but the disconnected between how our brain and eyes communicate. Vision therapy is a type of physical therapy for the eyes and brain, and is a highly effective, non-surgical treatment for the conditions above. By identifying and working through scientifically supported procedures under the supervision of an eye doctor, a patient can restore and improve their fundamental visual skills and abilities. Having your student’s eyes checked is fast, easy and can relieve a lot of worries and guess work as you help to have him succeed in school. Vision Therapy is an individualized program of therapy prescribed by an optometrist to improve the quality and/or efficiency of vision. This is different than the prescribing of glasses or contact lenses to improve one’s sight. Someone who has deficiencies in eye tracking, eye movement, focusing ability or eye coordination may experience reading as illustrated right. Typically vision therapy consists of weekly in-office visits with a Vision Therapist to work on activities and exercises prescribed by an optometrist as well as home exercises that are expected to be done 5 times a week. The length of the Vision Therapy program is different for each individual; like any therapy program, there are varying results across individuals. If you or your child is struggling with reading, losing his/her place while reading or just not achieving to their highest potential discuss this with your optometrist. Would you like more information on COVD and Vision Therapy? Click the COVD image. Or, refer to the links below for further reading. Check out our Vision Therapy Facebook Page! When necessary and started early, vision therapy can head off many future problems with learning and socializing. Call today to schedule an infant pediatric eye exam with our experienced eye doctor in Wainwright, AB.